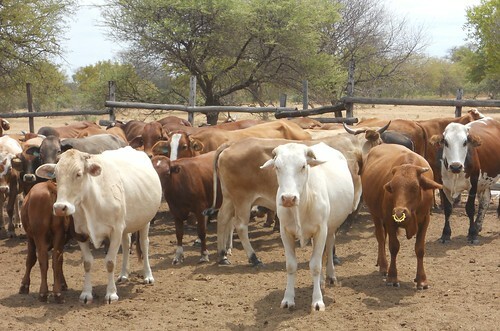 Cattle in Botswana. The country has successfully marketed its beef to high-value livestock markets (photo credit: ILRI/Saskia Hendrickx). At a recently concluded three-day (26-28 Jun) Africa Livestock Conference and Exhibition (ALiCE2013), held in Nairobi, Kenya, livestock researchers Hikuepi Katjiuongua, from Namibia, and Amos Omore, from Kenya, spoke of opportunities to link African smallholder farmers to high-value livestock markets. Globally, rising populations, urbanization and higher incomes are driving increasing demand for animal products. In Africa, this demand is especially high for milk, meat and eggs. Despite the opportunity this offers for Africa’s many livestock producers, the continent imports most of its animal-source foods because its livestock production is not keeping up with the growth in consumption of these foods. At the ALiCE2013 meeting, Katjiuongua, an economist with the Nairobi-based International Livestock Research Institute (ILRI), presented the ‘beef story’ from Botswana and Namibia, two African countries that have successfully marketed their beef in the European Union (EU). ‘The experiences from these countries show what works in efforts to access high-value livestock markets, particularly in the EU,’ says Katjiuongua. Katjiuongua also spoke about successes from dairying in East Africa, where removal of trade tariffs in the East African Community is one of the measures that helped double milk trade between 1995 and 2005. ‘Dairy producers in this region have benefitted from improved economies of scale, better access to services and technologies and an enabling policy and institutional environment,’ the authors said. The researchers, however, caution that to take up opportunities in high-value markets, smallholders will need help in addressing such challenges as the rising costs of livestock feed, veterinary services and other inputs, the prohibitive costs of complying with end-market requirements and high transport costs. As a way forward, Katjiuongua and Omore recommend lowering non-tariff barriers, improving smallholder productivity and competitiveness and investing in livestock data collection. 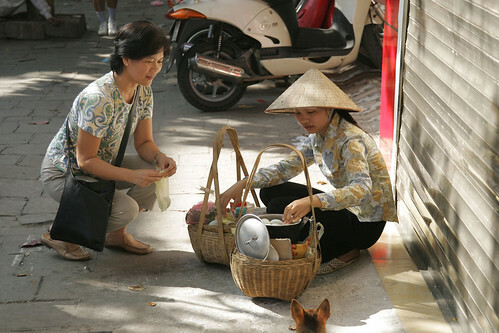 Lucy Lapar, an ILRI scientist, with a trader selling eggs in Hanoi, Vietnam. A CGIAR Research Program on Livestock and Fish is working to help poor communities play a bigger role in feeding the growing populations in developing countries (photo credit: ILRI/Stevie Mann). Last week (20–22 May 2013), a group of the word’s leading pro-poor livestock and other agricultural researchers met in Ethiopia to review ways of helping poor communities play a bigger role in feeding their developing countries’ growing populations by increasing their production of livestock-based foods—and doing so in ways that are sustainable over the long term. Four CGIAR research institutions—the International Center for Agricultural Research in the Dry Areas (ICARDA), the International Center for Tropical Agriculture (CIAT), the International Livestock Research Institute (ILRI) and WorldFish—as well as many other partners are working together in the CGIAR Research Program on Livestock and Fish. Tom Randolph, an agricultural economist at ILRI who directs this multi-disciplinary, multi-institutional research program, opened the Addis Ababa meeting by reviewing the objectives, challenges and achievements of the program over its first one and a half years. This program can directly help the world’s poor small-scale food producers and sellers significantly contribute to, and benefit from, meeting the challenge of feeding 9 billion people by 2050. This program focuses on the critical role animal-source foods play in nutritionally challenged populations. And it works to find ways to better organize, target and sustain the ‘intensification agenda’ for developing-world animal agriculture. We’re moving away from developing solutions to discrete livestock development problems faced by livestock keepers in specific settings to addressing all the bottlenecks in whole ‘value chains’ for pork, dairy and small ruminant production in eight selected developing countries. We’re working with partners to design integrated livestock development interventions that will work at large scale. And we’re working directly with development partners to better understand local context and to test our research-based interventions. Technology and research outputs, from both CGIAR ‘legacy’ projects and new ones, have led to improved fish strains, fodder varieties and smallholder dairy livelihoods. Developing a shared vision and coordinating plans among the many institutions involved in the program’s many projects, as well as filling several human resource gaps at program and project levels, have been real, if anticipated, challenges for this new program. Our objective is to design smart interventions that work at large scale. To succeed, we’ll need to invent new research methods and frameworks. And we’ll need to strengthen our partnerships with other research groups and work more effectively with development actors on the ground. This program expands our opportunities to do what many of us have always wanted to do—to ‘dig in’ to longer term research conducted in more meaningful partnerships. Read a related ILRI news article on this meeting: CGIAR research initiative boosts livestock and fish production and food security in eight developing countries. A map showing the focus value chains and countries that are part of a CGIAR Program on Livestock and Fish (photo credit: ILRI). In the face of rising global demand for animal-source foods, leading livestock and agricultural researchers from CGIAR are meeting this week (20–22 May 2013) in Ethiopia to explore ways to help poor people play a bigger role in feeding the planet’s growing populations by producing more livestock-based foods. These researchers are part of a CGIAR Research Program on Livestock and Fish, an initiative of four international research centres working with many other partners, which are all taking a new approach to tackle old problems. The International Center for Agricultural Research in the Dry Areas (ICARDA), the International Center for Tropical Agriculture (CIAT), the International Livestock Research Institute (ILRI) and WorldFish are collaborating on research into sustainable ways of increasing smallholder production of meat, milk and fish by and for poor people in developing countries. This collaborative research-for-development team is also working to help small-scale farmers sell more of their animal products in markets so they can improve their incomes and livelihoods. ‘We’re hoping that through this program smallholders and medium-sized livestock enterprises can do more than just escape poverty’, said Jimmy Smith, director general of ILRI. ‘We can do this by helping them to become better food producers and suppliers and by building partnerships that get this research used at scale’, he said. Started in January 2012, this Livestock and Fish Research Program focuses on eight value chains (processes through which commodities are produced, marketed and accessed by consumers): dairy, pigs, aquaculture, sheep and goats. Program staff members are currently working with farmer groups and other partners in Egypt, Ethiopia, India, Mali, Nicaragua, Tanzania, Uganda and Vietnam. Most of the program’s work to date has been to establish the institutional and scientific frameworks within which program staff will operate, work that is highlighted in the program’s annual report, published this past April. According to Tom Randolph, an ILRI agricultural economist who directs this multi-disciplinary and multi-institutional research program, in the past year and a half the program has succeeded (through some legacy as well as new projects) in helping to improve tilapia fish strains in Egypt, developing a thermostable vaccine for a highly contagious disease of goats and sheep (peste des petits ruminants, or PPR) in Kenya, improving varieties of a popular grass fodder (Brachiaria) for dissemination to farmers, and promoting pro-poor dairy development in Tanzania. Participants in this meeting, drawn from the four CGIAR research centres and other institutions based in Ethiopia that are participating in this Livestock and Fish Research Program, this week are devising the strategies, targets and action plans for the next phase of the program. Here, for your New Year’s reading/viewing pleasure, are 20 slide presentations on 12 topics made by staff of the International Livestock Research Institute (ILRI) in 2012 that we missed reporting on here (at the ILRI News Blog) during the year. 29-30 Nov 2012; posted on ILRI Slideshare 27 Nov 2012; 426 views. •  Livelihoods: 80% of the poor in Africa keep livestock, which contribute at least one-third of the annual income. The role of women in raising animals, processing and 3 selling their products is essential. – Direct – 17% global kilocalories; 33% protein; contribute food for 830 million food insecure. equitable, economically and environmentally sustainable. – Livestock provide 58 million tonnes of protein annually and 17% of the global kilocalories. 18 Nov 2012; posted on ILRI Slideshare 27 Nov 2012; 294 views. •  Nutritious foods for the malnourished. •  Market opportunities to meet high urban demand. •  Income opportunities for women and youth. •  Makes use of organic urban waste and wastewater. •  Can be considered ‘organic’ and supplied to niche markets. •  Ways to manage the perishable nature of these products. •  Innovative technological and institutional solutions for food safety and public health problems that suit developing countries. polluted water or wastewater for irrigation, and untreated sewage sludge for fertilizer. •  Innovative mechanisms that will ensure access by the poor to these growing markets. increasingly stringent food quality, safety and uniformity standards. 26−29 Sep 2012; posted on ILRI Slideshare 25 Sep 2012; 4,227 views. • In developing countries, livestock contribute 6−36% of protein and 2−12% of calories. • Livestock provide food for at least 830 million food-insecure people. • Small amounts of animal-source foods have large benefits on child growth and cognition and on pregnancy outcomes. • A small number of countries bear most of the burden of malnutrition (India, Ethiopia, Nigeria−36% burden). • Underused local feed resources and family labour give small-scale ruminant producers a comparative advantage over larger producers, who buy these. • Above-normal profits of 19−28% of revenue are found in three levels of intensification of dairy production systems. • Non-market benefits – finance, insurance, manure, traction – add 16−21% on top of cash revenue. • Dairy production across sites in Asia, Africa, South America showed few economies of scale until opportunity costs of labour rose. • Nos. of African smallholders still growing strongly. • Production still dominated by poor rural livestock keepers, incl. women. • Peri-urban fattening adds value. 26–27 Sep 2012; posted on ILRI Slideshare 13 Oct 2012; 468 views. 4–6 Mar 2012; posted on ILRI Slideshare 7 Mar 2012; 1,108 views. 10–13 Dec 2012; posted on ILRI Slideshare on 18 Dec 2012; 3,437 views. 26-29 Mar 2012; posted on ILRI Slideshare 27 Mar 2012; 1,999 views. 22–24 Nov 2012; posted on ILRI Slideshare 30 Nov 2012; 516 views. by disadvantaged livestock rearing communities in rural India. to address technological, institutional and policy gaps. 5 Nov 2012; posted on ILRI Slideshare 21 Dec 2012; 8,003 views. What is the Technical Consortium? with ILRI representing the CGIAR Centres and the FAO Investment Centre representing FAO. • ILRI hosts the Coordinator on behalf of the CGIAR. in the region and harnessing, developing and applying innovation and research to enhance resilience. • An innovative partnersh–ip linking demand-driven research sustainable action for development. What is the purpose of the Technical Consortium? the IGAD Drought Disaster Resilience and Sustainability Initiative (IDDRSI). resilience-enhancing investment programmes for the long term development of ASALs [arid and semi-arid lands]. • To harness CGIAR research, FAO and others’ knowledge on drought resilience and bring it to bear on investments and policies. 27 Oct 2012; posted on ILRI Slideshare 29 Oct 2012; 385 views. 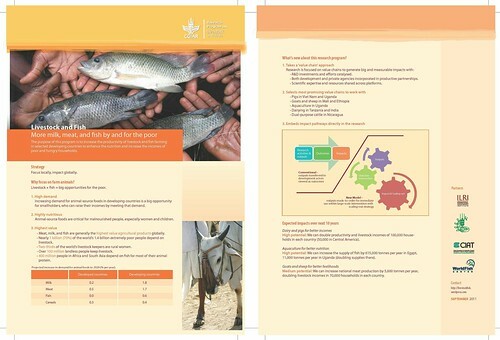 • Can research accelerate livestock and aquaculture development to benefit the poor? – Also related to our research-for-development model?
. . . and better manage the transition for many smallholder households. 18 Oct 2012; posted on ILRI Slideshare 22 Oct 2012; 576 views. • Based on satellite data on forage availability (NDVI), this insurance pays out when forage scarcity is predicted to cause livestock deaths in an area. • Ethiopia pilot launched in Aug 2012. 26–28 Nov 2012; posted on ILRI Slideshare 5 Dec 2012; 1,395 views. •  Goals: capacity building & evidence-based knowledge•  8 Research & outreach teams in 6 countries. 15–18 Oct 2012; posted on ILRI Slideshare 23 Nov 2012; 255 views. • 25% of livestock have Q fever, and are a major source of infection of farmers and consumers. 19–22 Feb 2012; posted on ILRI Slideshare 5 Mar 2012; 529 views. 21 Jun 2012; posted on ILRI Slideshare 24 Nov 2012; 189 views. • By 2050 Africa is estimated to become the largest world’s market in terms of pop: 27% of world’s population. 8 Mar 2012; posted on ILRI Slideshare 8 Mar 2012; 876 views. 16–20 Feb 2012; posted on ILRI Slideshare 20 Feb 2012; 2,405 views. 15 Feb 2012; posted on ILRI Slideshare 27 Feb 2012; 762 views. Those interested in the future of the livestock sector—particularly in its potential to help alleviate world poverty and hunger without harming human health and the environment—will want to watch this 10-minute film of brief comments made by seven leaders in livestock development thinking. These comments were captured at the end of a recent (12–15 Mar 2012) ‘High-Level Consultation for a Global Livestock Agenda to 2020’, which was co-hosted by the World Bank and the International Livestock Research Institute (ILRI) and held at ILRI’s headquarters, in Nairobi, Kenya. The seven participants interviewed are (1) Francois Le Gall, co-host of this consultation and livestock advisor at the World Bank; (2) Henning Steinfeld, chief of livestock information and policy at the United Nations Food and Agriculture Organization (FAO); (3) Kristin Girvetz, program officer at the Bill & Melinda Gates Foundation; (4) Bernard Vallat, director general of the World Organisation for Animal Health (OIE); (5) Boni Moyo, ILRI representative for southern Africa; (6) Carlos Seré, chief development strategist at the International Fund for Agricultural Development (IFAD); and (7) Jimmy Smith, co-host of this event and director general of ILRI. Read more about this consultation on this ILRI News Blog: Developing an enabling global livestock agenda for our lives, health and lands, 13 Mar 2012. 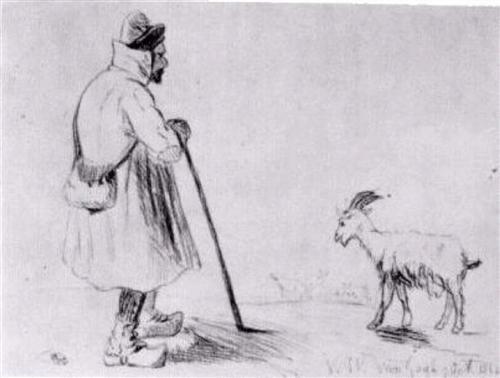 The Goat Herd, by Vincent Van Gogh, 1862 (source: Wikipaintings.org). And sometimes even that is denied. An interesting new report on Small Ruminant Rearing: Product Markets, Opportunities and Constraints makes a strong argument for enhancing the value chains of India’s meat, leather and wool industries to reduce poverty levels among the country’s many sheep and goat rearers, who make up 15% of all rural households in the country and most of whom (70%) are small and marginal farmers and landless labourers. The report was published in Dec 2011 by the South Asia Pro-Poor Livestock Policy Programme, a joint initiative of India’s National Dairy Development Programme (NDDB) and the United Nations Food and Agriculture Organization (FAO). The report was developed by Varsha Mehta, a consultant working with this South Asia livestock program, who spent six months (Nov 2010–Apr 2011) gathering information in extensive field visits and discussions with practitioners and communities rearing small ruminants in various states of the country. Some the key findings, appearing in report’s the executive summary, are summarized below. With 15% of the world’s goat population and 6% of its sheep, India is among the highest livestock holding countries in the world. As of 2009, its estimated sheep and goat population was 191.7 million, comprising 10% of the world total. Most of India’s goats (70%) are found in just 7 of the country’s 28 states (West Bengal, Rajasthan, Uttar Pradesh, Maharashtra, Bihar, Tamil Nadu and Madhya Pradesh) and 72% of the sheep population is concentrated in just 4 states (Andhra Pradesh, Rajasthan, Karnataka and Tamil Nadu). Although total numbers of such small stock have been rising in the country, average numbers per household have been falling, by about 25%—from 85 to 64 per 100 households—in the 11 years between 1991/2 and 2002/3. The ownership and distribution of small ruminants in the country appears to be more equitable than that of land. Livestock rearing in the country has been primarily for livelihood security and not for commercial purposes, with ownership being more evenly distributed vis-à-vis land and other resources; animals are a hedge and insurance against natural calamities, droughts, etc., and animal husbandry is frequently one of the many occupations in a household’s livelihood strategy. However, the commercialization of livestock is on the rise as a result of market developments and fiscal incentives, and an increasing demand for animal protein in the consumer market. A gradual shift is occurring towards intensively managed ram lamb/sheep units, particularly in the southern Indian states of Karnataka and Andhra Pradesh, which is being led and/or facilitated by animal health professionals, state veterinary departments and financial institutions. India’s single-minded pursuit of agricultural enhancement at all costs has harmed its animal husbandry. Government-planned and -sponsored schemes for intensifying agricultural production systems through land development and irrigation have led to a rapid loss of lands available for grazing sheep and goats, declining land and soil productivity, greater reliance on chemical fertilizers and higher costs of agriculture inputs. With the loss of grazing lands, flock sizes have decreased, with, for example, the average flock size in the ‘shepherd belt’ of Rajasthan declining from 200–300 to 60–70 sheep over a period of 10 years. The numbers of keepers of small stock have also declined, with many former shepherds and goat rearers now working as daily wage labourers. Another threat to India’s small stock keepers are high levels of livestock diseases and deaths due to state veterinary health services and facilities unable to meet the veterinary demands of local and migrant graziers, breeders, rearers and shepherds. With an estimated 25,000 unauthorized slaughter locations and 4,000 registered slaughterhouses, India’s meat trade is highly unorganized and largely unregulated, having remained a low priority sector until the Eleventh Five Year Plan (2007–12), when incentives were provided to industries to boost investment for modernization, value addition and infrastructure development. The many entities responsible for licensing, regulating and controlling quality in the meat processing and export sectors lead to inefficiencies, and the mechanisms in place are largely ineffectual and the institutions involved largely under-resourced. Although India’s meat market is predominantly a ‘wet market’ (dealing in live animals), knowledge of, and adherence to, food safety standards and regulations are greatly lacking, which poses the threat of infectious and other diseases erupting among livestock populations and some of them (zooneses) being transmitted between livestock and people. India’s small ruminant markets favour brokers and other intermediaries to the disadvantage of consumers, rearers and sellers of livestock by-products. A large part of the consumer’s costs are due to inefficient slaughter operations and markets and high transportation costs. Inefficient use of small ruminant by-products means the rearers get poor prices for their animals. New players face barriers in entering the market and robust agents’ networks and strong resistance to government attempts to introduce change hamper the modernization or relocation of abattoirs. The non-standardized, unregulated and ad hoc transactions typical of India’s small ruminant trade lead to unfair practices. For example, animals are sold purely on the basis of a visual estimation of their weight, age and appearance, and female animals get lower prices than males in meat markets, even though no such distinction is made in the final price of meat sold in retail outlets. And although sheep fetch a lower price than goats, sheep meat is frequently passed off as goat meat in New Delhi. With India’s small ruminant market remaining predominantly a wet market, given the preference of the Indian consumer for fresh meat over frozen or processed meat, little value addition takes place along the chain from producer to consumer although the price of the commodity rises at every level. Whereas the blood, head, legs and offals of slaughtered sheep and goats are often sold near slaughterhouses in terminal markets and at village butchers’ shops, full potential of the by-products’ (skin, casings, bones, blood and other waste) is not realized in the country. By bringing the market closer to the production base, it would be possible to address many problems that plague efficient operations in the meat industry. The terminal markets in all cities are constrained on account of space and municipal requirements for waste disposal. Both these issues could be addressed at the district level through appropriate site selection, long-term planning, and establishment of effluent treatment plants. District-level livestock trade centres would also be more accessible to producers, and lower the costs of transporting live animals, which are often transported in poor conditions across long distances and suffer poor lairing at terminal markets before their slaughter. While most of the leather industry’s units are small and medium enterprises, with 60–65% of the production coming from small/cottage sectors, the industrial structure, which till now has been mostly unorganized and decentralized, is gearing up fast in response to international market demand and a changing policy environment. The gains that the leather industry has made over the years, due to favourable government policies and growth in international markets, have not trickled down to the players operating at lower levels in the leather value chain. And developments in the processing and manufacturing sectors are not accompanied by corresponding developments in raw material production and collection methods, which continue to be highly scattered and unorganized. Too little raw material, and material of poor quality, due to inappropriate methods of procurement of raw hides and skins, and their flaying and curing, are hurting India’s leather sector. Losses from putrefaction and low-quality raw material could be addressed through worker collectives established close to the source of production, which could reduce the time lag between removal of skin and its (temporary) curing for preservation. Apart from the cost of inputs for treatment (salt) and storage (warehouse), the only other costs would be those of labour and the initial investment in organizing and establishing the collective. This small intervention in the leather value chain could go a long way in resolving higher end problems, as well as providing employment for many poor people. Operations in leather processing and finishing are labour-intensive except in the initial stages, with the costs of labour rising as the product moves along the value chain. In many attempts to promote its leather industry, India has focussed on manufacturing and finished goods to the exclusion of all other aspects, such as procuring hides and skins and/or improving slaughterhouse practices, both of which could add significantly to the quality and availability of raw material. Trained human resources are in short supply. The entire production system that supports India’s wool industry is crippled by a loss of grazing lands and reduced flock sizes. In Himachal Pradesh, graziers since the British times have been issued permits for grazing their herds, with migratory routes and numbers specified in the permit issued by the Forest Department. A specified fee per animal is charged per season. Over the years, there has been a restriction on the issuance of new permits, and the common practice now is for herds to be taken for migration by (existing) permit-holders on a contractual basis. Grazing grounds/pastures have also shrunk and degraded with the spread of weeds, which can also cause of high mortality, particularly in younger livestock. Since changes in India’s import policies and licenses took effect, the markets have been flooded with products made of imported wool. The rising costs incurred by shepherds in rearing sheep and shearing their wool are not matched by a corresponding rise in returns from wool. Loss of markets for traditionally valued products have caused a loss in demand for local wool. A revival of the local wool markets is possible only through revival of Khadi institutions, as well as significant and sustained investments in R&D of products made out of local wool. Only a small proportion of sheep (10–15%) have been crossbred. State-led initiatives for breed improvement have focused on the production of finer quality wool through crossing indigenous breeds with imported breeds such as the Merino and Rambouillet. The crossbreeding programs face two main problems: crossbred sheep have higher mortality levels than native sheep because they are unable to withstand the nutritional stress and difficult terrain/conditions; and the crossbreeding program has not yet led to the production of significant quantities of superior wools. Some scientists say there is a lack of high-quality germplasm available for improving wool quality and yield. Read the whole report: Small Ruminant Rearing: Product Markets, Opportunities and Constraints, South Asia Pro-Poor Livestock Policy Programme, Dec 2011. A year-old project on ‘Small ruminant value chains as platforms for reducing poverty and increasing food security in the dryland areas of India and Mozambique’, known as ‘imGoats’ for short, seeks to investigate how best goat value chains can be used to increase food security and reduce poverty among smallholders in India and Mozambique. The main target groups are poor goat keepers, especially women, and other marginalized groups, such as scheduled castes and tribes in India, households with members living with HIV/AIDS and female-headed households in Mozambique. The project is led by researchers from the Market, Gender and Livelihoods Theme of the International Livestock Research Institute (ILRI) in collaboration with the BAIF Development Research Foundation in India and CARE International, Mozambique. It is funded by the International Fund for Agricultural Development (IFAD). The goal of the imGoats Project is to increase incomes and food security in a sustainable manner by enhancing small ruminant value chains in the two countries. The project proposes to transform goat production and marketing from the current ad hoc, risky, informal activity to a sound and profitable enterprise and model that taps into a growing market, largely controlled by and benefiting women and other disadvantaged and vulnerable groups while preserving the natural resource base. The project established a strategic advisory committee at the national level in each of the project countries. In India, the South Asia Pro-Poor Livestock Policy Programme (SAPPLPP) is one of seven agencies represented on this committee; the others are the Animal Husbandry Departments of Governments of India, Rajasthan and Jharkhand; IFAD; BAIF; and ILRI. The first national advisory committee meeting of the imGoats project in India was held on the 17 Aug 2011 in New Delhi; it meets every six months, with its next meeting scheduled for 10–11 Feb 2012, in Udaipur and Jhadol. For more information, visit ILRI’s imGoats Blog. Among flyers of the CGIAR Research Programs displayed at the G20 meeting on ‘Agriculture Research for Development: Promoting Scientific Partnerships for Food Security,’ in Montpellier, France, 12-13 Sep 2011, was this one on ‘Livestock and Fish: More Meat, Milk and Fish by and for the Poor’ (brochure by ILRI [content] and CIP [design] for the CGIAR Consortium). 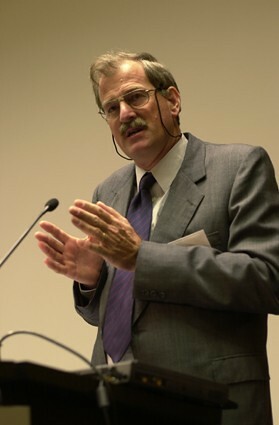 On 16 Sep 2011, the chairman of the board of the CGIAR Consortium for International Agricultural Research, Carlos Pérez del Castillo, made the following statements, which are excerpted from a message he sent to the directors general of the 15 CGIAR centres, including the International Livestock Research Institute (ILRI), which leads the CGIAR Research Program on Livestock and Fish: More Meat, Milk and Fish by and for the Poor. ‘The G20 Conference on Agricultural Research for Development just held in Montpellier (12–13 September 2011), was the first conference in the history of the G20 that focused on issues of international agricultural research for development. David Nabarro called it a “historic event of momentous proportions”, because of the strong consensus that emerged from the discussions on the key role of international agricultural research for development in providing sustainable long-term solutions to global food security. ‘Participants comprised the G20 representatives of Agriculture, Research and Foreign Affairs Ministries, as well as the Directors General of G20 Agricultural Research institutions. Key international institutions participated as well: GFAR [Global Forum on Agricultural Research], FAO [United Nations Food and Agriculture Organization], the World Bank and the CGIAR Consortium. . . .
‘With the objective to promote international scientific partnerships for Food Security, this was a working meeting with four sessions. The first, on how to increase coordination of agricultural research systems in the G20 countries was chaired by Japan and the CGIAR gave a keynote presentation . . . . It was heartening to hear many delegations state that existing coordination mechanisms, such as the CGIAR Research Programs and the GCARD Roadmap, are particularly well positioned to facilitate international coordination . . . .
‘[T]hroughout the Conference, extensive references were made to a strong commitment to international agriculture research for development and to the important role that the reformed CGIAR is expected to play in the international arena, as facilitator of research synergies among G20 countries. . . . There was . . . an overwhelming consensus that more stable and longer-term funding are needed for international agricultural research to succeed in providing long-term options and solutions to global food security. . . .
‘We expect that the salient points from this meeting will be used as input for the joint G20 ministerial Finance and Development meeting in Washington (September 25), and for the Heads of States Summit, in Cannes (November 3–4). . . .
View the poster on the CGIAR Research Program on Livestock and Fish. Watch this 11-minute video of a slide presentation made by ILRI Director General Carlos Seré in Los Banos, the Philippines, in late 2010 (video produced by the International Rice Research Institute). In a slide presentation on ‘Reinventing Agriculture in the 21st Century: Livestock Systems in Africa,’ Carlos Seré, director general of the International Livestock Research Institute (ILRI), made three main points. First, livestock is the fastest growing part of developing-world agriculture. It’s the ‘demand pull’ that can drive these agricultural systems. Second, these are all ‘mixed systems’, with crop growing mixed with livestock raising; understanding the interactions between them is essential for the design of any strategy for agricultural development. Third, we have a lot of the building blocks to achieve ‘sustainable intensification’ of smallholder agricultural production, but the real challenge is much more institutional in nature—how do we tie everything together, scale out the best interventions, and deliver them effectively? Data from the United Nations Food and Agriculture Organization (FAO) tells us that the most important agricultural commodity in the world is cow’s milk, followed by rice, cattle meat, pig meat, chicken, wheat and eggs . . . So we can see that livestock is central to the global agricultural sector and becomes increasingly so as societies develop. In developing countries, rice is the number one commodity, followed by indigenous cattle meat and cow’s milk. Due to population growth and other factors, the developing world’s livestock systems are changing fast and in big ways. Science can help the world’s poorer livestock keepers to work with these trends. Most people in developing countries live in areas where mixed crop-livestock systems predominate. That is something we tend to forget: we tend to come in with a specific disciplinary approach, looking at crops or trees or livestock in isolation, when all these and more are integrated in a whole agricultural system that we must attend to. Seré summed up his presentation by saying that livestock is the motor that brings in cash to smallholder mixed farmers. While cereals sustain the family, animals are the cash source. There’s a lot of potential to help small-scale livestock keepers to reduce the amount of greenhouse gases produced per kilo of livestock output. A lot of the techniques and interventions needed to intensify smallholder food production are already there; the challenge is how to bring them all together at scale and in useful ways for the farmer.